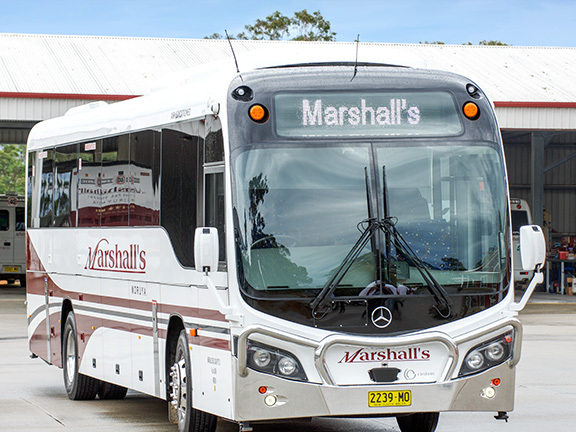 Marshall’s Bus and Coach is a family-owned and operated business that has operated in the Moruya district on the NSW south coast for the past 25 years. 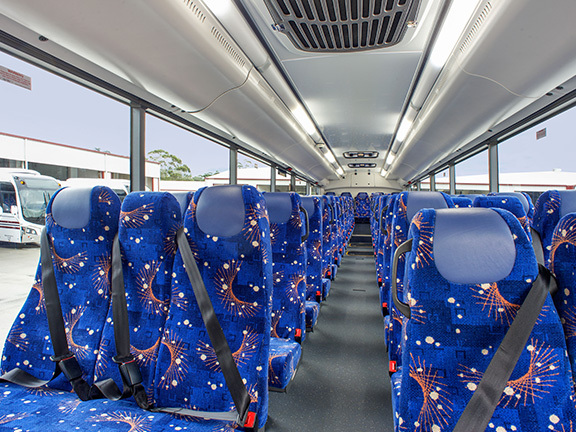 Earlier this year it took delivery of 12 new SB50 buses built by Custom Bus Australia for its school bus fleet. I met the Marshall brothers (Peter and Wayne) and Luke Jolly from Custom Bus Australia to find out about Marshall’s and why it chose Custom Bus for this significant purchase. "Dad was semi-retired when we bought the bus runs at Tuross Head, and when the Moruya bus company come up for sale we bought them out," Peter says. "After that my brother Wayne came home from the Northern Territory to join us in the business and things grew from there. "Unfortunately dad passed away just over eight years ago so since then it has been Wayne, his wife Julie and myself running things. Recently my eldest daughter Melissa has joined the business so we certainly are a family concern." Asked what makes Marshall’s a successful business, Peter attributes the family bond and a resolute work ethic as the main drivers. "In the early days it was all hard work for the business. For years that is what we did to get established and everything we did went back into the company. It was all to achieve greater success for our family and the business. "Since dad passed away we have been able to enjoy some of the rewards of our hard work and holiday, and I also get to reap the benefits of sharing the workload with Wayne. "The early days were to work tirelessly every day for the business and put all our earnings back into the company. I think that initial hard work is the reason we enjoy the success we do today." The family is so close knit that even Helen, Peter and Wayne’s mother, came out for a test drive of the new bus. She recalled a story about Peter’s early driving experiences. "When we first started out, Peter was complimented on his driving after he filled in for me on a charter with my walking people when I had a sore foot and couldn’t drive. They kept saying to me, ‘His dad taught him how to drive well,’ and thanked him for his good driving. "Peter had to tell them all it was me who taught him. The next meeting I went to they all asked if it was true that I had taught him to drive the bus instead of his father, and I said, ‘My word his father was a horrible driver – I taught Peter how not to drive like his father.’"
Having operated the business for more than 25 years, Peter explains that things are a lot different now to when the company started; importantly, it’s had to embrace technology and all its advances and changes. "The new buses make life a lot easier in some respects. All these new computerised buses have meant a change in how we operate. "There have, of course, been many challenges in dealing with the changes in the transport industry along with all the technical requirements. "The changes to buses have been one thing, but the changes to the technology with buses becoming computerised has meant we now use specific diagnostic scan tools and our mechanics have had to complete courses and update their skills in Sydney to learn how to ‘talk to the buses’ basically. "It’s no longer like the old days where you had to figure things out mechanically – now it is all computerised." Dealing with Transport for NSW has "probably been the hardest battle", according to Peter, as the company learns about – and adjusts to – the changes, with advanced security systems a welcome development. "For this part we are lucky to have Melissa coming on board. Like most young people, she is ‘computer switched on’, as is Wayne’s wife Julie, so between the two they work out what the department requires and what we need to do to meet the changing requirements. "There is now a lot more reporting for both us and the drivers, so you no longer just go out and drive a bus. You need to report everything as it happens. "The security camera systems have been a huge advancement and they pay for themselves. Recently we had an on-bus incident and the video footage was crystal clear – it was easily visible what had happened. The footage is played and the incident is dealt with according to what the cameras have captured. "Before cameras there was an interview process and varying opinions, but the cameras are worth their weight in gold for both the drivers and the company." 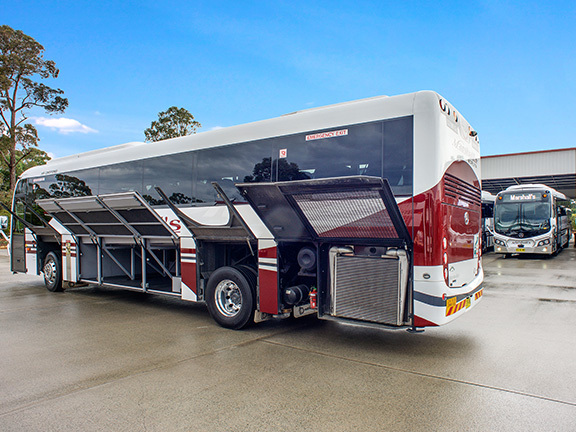 Custom Bus Australia is based in Sydney and proudly states it is the second-largest bus body building company in Australia, manufacturing environmentally sustainable buses designed for a 25-year life cycle. The company says it has been able to maintain manufacturing in Australia by constantly adapting and investing in technology and training, which is one of its main core commitments. 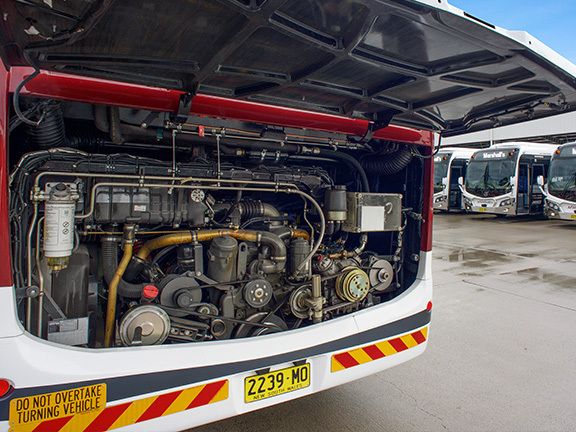 Subsequently, Custom Bus has invested heavily over recent years into its state-of-the-art manufacturing site at Villawood. "Ninety-two per cent of our bus materials come from Australia and Australian companies," Custom Bus national sales manager Luke Jolly says. "All of our buses are made in Sydney and we are a 100 per cent Australian-owned company." Marshall’s took delivery this year of 12 Custom SB50s from Custom Bus Australia to be part of its 22 daily school run services operating from Bodalla and Moruya. When choosing a new bus for his fleet, Peter attributes reliability and supplier back-up as key qualities, reflected in Marshall’s relationship with Custom Bus. "We have built a good working relationship with Custom Bus and Luke Jolly; we understand each other, and he knows what Marshall’s expects from our vehicles," he says. "Vehicle accessibility was a priority for the electric componentry, the back-up service provided is excellent, and the fact that they are in Sydney is nice and close for us. "I love that the body is Australian made; we’ve been to the factory and seen them being built. If we have any questions we can speak to someone in Australia and that gives us excellent access to spare parts and any help we may need. "Custom are happy to send a service vehicle to us if we need any help. I wasn’t interested in having to make calls overseas and having the time and language barriers I’d run into before." we have purchased a vehicle and down the track spare parts are no longer available," he says. "We weren’t interested in the cheapest alternative; we find Mercedes-Benz are a quality product with excellent back-up service." Custom Bus Australia advertises this model, the SB50 that we are test driving, as being designed for the demanding Australian conditions using cutting-edge technology and the latest automotive materials to produce a lighter, stronger, better quality and value school bus for local operators. 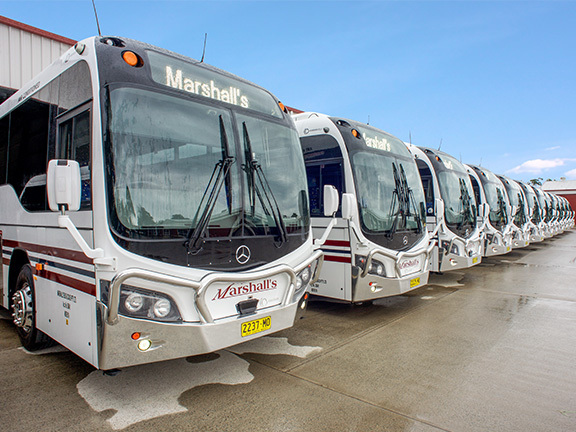 Marshall’s had the 12 new buses lined up in the yard painted in Marshall’s company colours with tight-fitting alloy bullbars. From the exterior they were much smarter looking than what you’d normally expect from a school bus. The Mercedes-Benz OC 500RF 2-axle chassis has a water-cooled 6-cylinder, in-line, 4-valve, turbocharged and intercooled engine with Euro 5, 260kW (354hp) of power and 1600Nm of torque, and ZF-EcoLife 6-speed automatic transmission with torque converter and integrated hydraulic retarder. 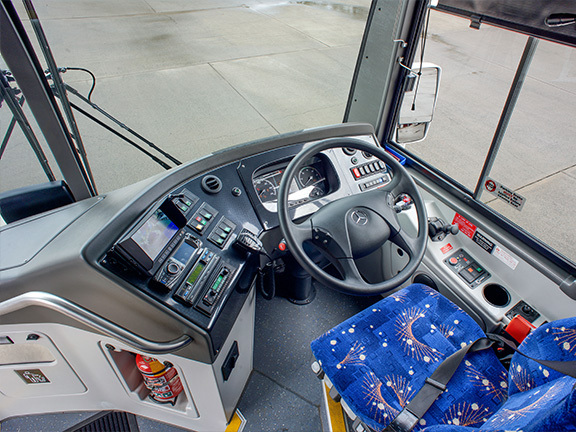 reversing buzzer (the hazards come on automatically when reverse is selected), Isri driver’s seat, an electric driver’s blind, easy-to-navigate controls, and excellent directional air vents for the driver. It is also fitted with a Thermo King KRS air-conditioning system and Styleride Solution 3-2 seats. The underneath storage is bigger than what’s required for school routes, but there’s ample room for charter tour luggage going through from side to side. The external Cannon mirror arms with Hasmotek (Metagal) twin glass mirrors are electronically adjustable with heated mirror heads. Both are smart-looking externally but do the job well for the driver. They have a blind-spot mirror inbuilt at the base that is ideal for additional safety with children. For the drive, we left the depot and headed out along some scenic country roads which the Marshalls refer to as Col Dakin’s run. Col was a long-serving employee that had recently passed away. I could tell how they kept talking about him that they all really missed him and it seemed throughout the day that this family business has a great relationship with all its people. Peter completed the initial part of the cruise so I could experience the bus as a passenger. The drive was super quiet; the SB50 has a vacuum-sealed Ventura plug door that really helps to reduce normal internal noise. For my part of the drive we headed into Moruya. The driver’s cabin was extremely comfortable with everything placed well for ease of use. My one minor criticism was that, being an automatic vehicle, I asked why there was no driver’s left footrest. I was told this had been an option which Marshall’s decided not to include. I guess that comes down to personal preference as it differs for most of us drivers. Vehicle power, handling, and ease of driving were great and exactly what you’d expect from a new build with a Mercedes buggy, but typically school buses are not this comfortable; it would certainly be a relaxed ride for much longer trips. The Custom SB50 was more coach-like than a school bus. We even did a U-turn on a quiet stretch of road and the turning circle was surprising. I enjoyed the bus so much that I told the Marshalls I could get used to driving it. They did offer me a job but the five-hour commute might be too difficult! Asked what the future holds for Marshall’s, Peter sees good things emanating from Melissa’s involvement in the company. "Having my daughter join the business has been great for Marshall’s. We recently purchased Franksbook Educational Tours Services to give us a new direction organising year-six excursions to Canberra, and Melissa has taken on this new venture. "As a coach operator we have been doing this sort of tour for years, but the new change gave Melissa the opportunity to write and develop her own itineraries, choose the accommodation, and do all the bookings. She is putting her own stamp on this part of the business and helping the coach side of things grow, so this is very exciting for us". "The main things we aim for are having quality vehicles and providing great service. Much of our success with our business comes from our great staff – we pride ourselves on having good-quality vehicles driven by great drivers.